We’re all born creative. Of that I’m certain. Archaic educational systems just ring the creativity out of us. Either that, or discontented elders convince us we’re not creative (in an effort to soothe the ache in their own souls). And some of us, well, we just forget we’re born with creativity pulsing through our veins. But we are. We all are. Creativity of this sort isn’t the sole domain of artists, musicians, dancers and poets. It’s a birthright bestowed upon each of us from the first moment we open our eyes. It’s the domain of ‘makers’ and ‘creators’, of builders and gardeners and cooks and teachers. It’s the playground of snowboarders and surfers; and the creative space of entrepreneurs, innovators and legislators. Every act we make, every breath we take and project we pursue is an act of creation. We are all creative. In forgetting our creativity, we limit it - and our power. In not owning our creativity, we subconsciously squeeze it into the shape and confines of society’s story lines. We belittle ourselves and render ourselves bland and boring. We end up colouring between the lines and inadvertently burying the ‘jewels hidden within us’. Instead, we go digging for someone else’s treasure – and our world is denied the delight of seeing our own sparkle. Courage. + Curiosity. + Joy. = Creative Living. What does that mean? Well, to touch upon the transcendent is to allow our joy. It’s to love ourselves enough to let ourselves be ourselves – and it’s the path that leads to the treasure hidden within us. So ask yourself – what sparks your curiosity? What, when you do it, do you lose yourself in? What sends your cells into sparkling showers of glee? What lights the innocent eagerness of your childhood self? Now go and dig there – with stubborn discipline and innocent eyes free from expectation. So creative living demands courage. Indeed, it's “a life that is driven more strongly by curiosity than by fear”. The lesson? Don’t wait for the doubts and the fears to disappear. Don’t wait until you feel perfectly baked and perfectly ready. Creativity isn’t a path of perfection. It’s not the domain of neatly groomed manikins masquerading as humans. It’s messy and littered with the unexpected and quirky. And it’s never the same twice. Too often we’re confined by our fear. Confined by our what-ifs and anxieties. Disconnected from our inherent creativity and power by the looming fear of failure, or rejection, or starvation. And yet, what would happen if we courageously and studiously made space for our curiosity, joy and creativity? I can only speak for myself, but the more I dare to dance with that transcendent spark of joy in me, the more epic life gets. show up daily with curiosity and courage. 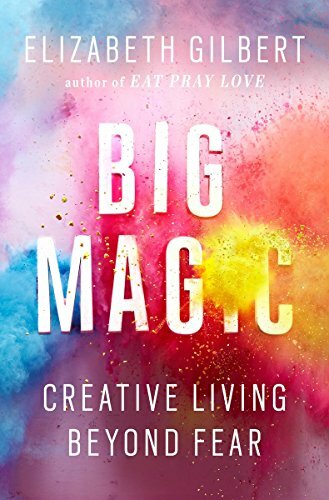 For those of you ready to embrace your creativity and welcome more magic in life – check out Gilbert’s book - Big Magic: Creative Living Beyond Fear. And coming soon from my writing desk – more on making peace with your fear. Want a little extra support to let that creativity free in the world? Contact me about creativity and wellness coaching.